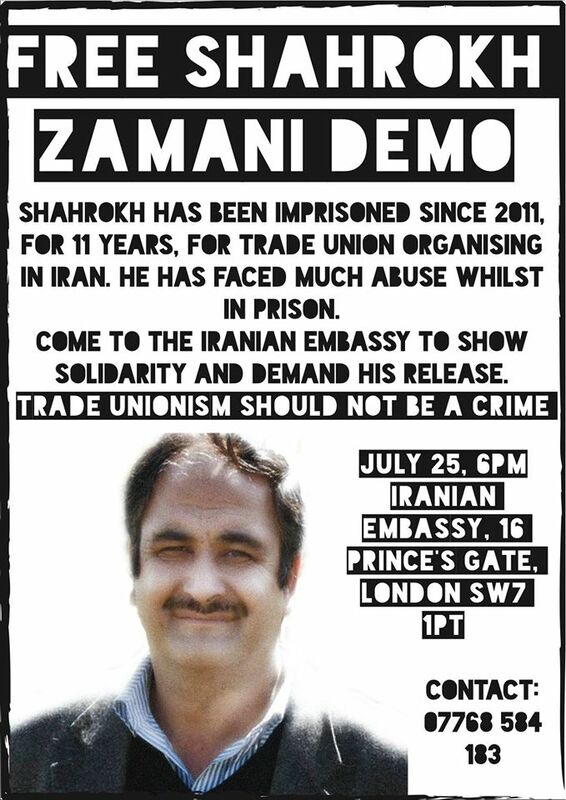 Come to the Iranian Embassy to show solidarity with Shahrokh Zamani and demand that the Iranian authorities release him immediately – trade union activism should not be a crime! A friend of Shahrokh, Reza Shahabi has also been unjustly imprisoned for working within the Syndicate of Tehran and Suburbs Bus Company. He has been imprisoned since 2010 for “gathering and colluding against state security” and “spreading propaganda against the system” . His sentence is 4 years in prison, 5 years ban from trade union activities and a 70 million rial fine. He started his latest hunger strike on the 1st of July and his condition is deteriorating. Come to the Iranian Embassy to show solidarity with Shahrokh Zamani and Reza Shahabi and demand that the Iranian authorities release them immediately – trade union activism should not be a crime!